"There cannot be a blueprint or a time limit for a freedom struggle. Everything depends on the situation in our homeland and happenings on the international scene. " A: The democratic parliamentary system, or what you refer to as the conventional political system in Sri Lanka, has always tried to impose the will of the majority on the minority. This system not only failed to solve the basic problems of our people but, in fact, aggravated our plight. For decades, the repression by the state has made the life of our people miserable. The non-violent democratic struggles of our people were met with military repression. Our just demands were totally ignored, and the oppression continued on such a scale as to threaten the very survival of the Tamils in Sri Lanka. It was these circumstances which led me to form our liberation movement. I felt that an armed struggle was the only alternative left to our people, not only to ensure our survival but ultimately to free' our selves from the Sinhala oppression. I have always been aware that our movement would be outlawed. It is for this reason that we organised our movement as a clandestine under ground structure from its inception. Q: What was the reason for identifying yourselves as 'Tigers'? A: I named the movement 'Liberation Tigers' since the tiger emblem had deep roots in the political history of the Tamils, symbolising Tamil patriotic resurgence The tiger symbol also depicts the mode of our guerrilla warfare. Q: When you decided to form the 'Liberation Tigers', what was the reaction of your family members and those close to you? A: After all these years of struggle I feel that we are advancing towards our goal. The '83 July holocaust has united all sections of the Tamil masses. There is a massive support for the armed liberation program of our movement. This is certainly a step towards our goal. Q: How would you defend your movement from being called a "separatist" one. and that you all are not freedom fighters but "terrorists"? A: It is wrong to call our movement "separatist". We are fighting for independence based on the right to national self determination of our people. Our struggle is for self determination, for the restoration of our sovereignty in our homeland. We are not fighting for a division or separation of a country but rather, we are fighting to uphold the sacred right to live in freedom and dignity. In this sense, we are freedom fighters not terrorists. Q: Do you think that India's good offices will result in anything tangible? A: India's efforts have given a positive hope to our people. But I do not think that the Sinhala racist government will utilise India's offer to resolve the problems of the Tamils. A: We have the courage, confidence and determination to fight and win our freedom. We should fight and free ourselves. But we do need India's support and sympathy. Q: What do you think is Jayewardene's intention behind holding these negotiations? Is he buying time? Q: Is it the result of the Buddhist clergy's chauvinism or is it the result of a natural alignment following the Catholic clergy's association with the Tamils.? A: The Buddhist clergy's chauvinism has played a significant role in the establishment of a racist state system. Sections of the Tamil Catholic clergy sympathise with the Tamil cause but the Sinhala Catholic clergy displays strong Sinhala national chauvinism and are opposed to the Tamil demands. A: So far we haven't got any confirmed reports about the presence of Israeli military experts in Sri Lanka. If the reports are true I won't be surprised. Sri Lanka is turning into a base for US imperialism and its agents. Whoever the trainers are or whatever their expertise maybe. the Sinhala army cannot crush the will and determination of the Tigers. We have a great moral power. a supreme sense of sacrifice, and a noble cause. A: Induction of US arms is not only a threat to the Tamil freedom movement but also to India's national security. America's objective as you will certainly be aware. 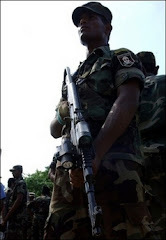 is not simply confined to helping the Sri Lankan army to crush the Tamil liberation struggle. Their ultimate aim is to secure a naval base at Trincomalee. Such a happening will convert the Indian Ocean into a war zone, and will increase the tension prevalent in the region.